New Delhi: Calling the opposition alliance "opportunist", Prime Minister Narendra Modi on Sunday accused the parties coming together ahead of the Lok Sabha polls of practicing negative politics for their own existence and said the BJP was not in politics for "divide and rule" or building vote banks. The Prime Minister's attack come during his interaction with booth level BJP workers from Mayiladuthurai, Perambalur, Sivaganga, Theni and Virudhunagar in Tamil Nadu through video conference. "Unlike other parties, we are not in politics for divide and rule or building vote banks. We are here to serve the country in every possible way. 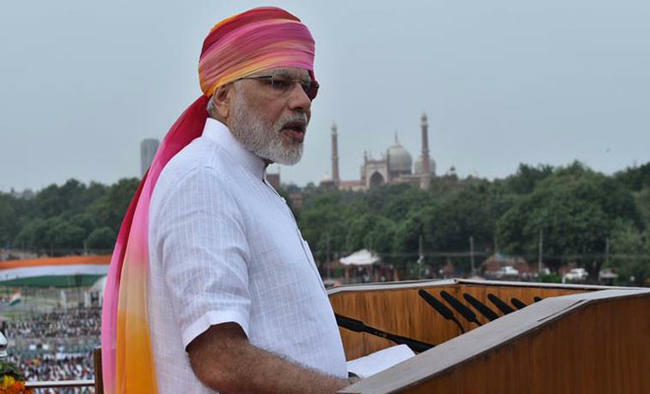 The upcoming polls are very important for BJP and the country," he said. 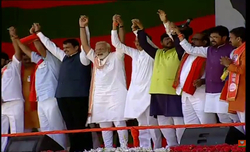 "On one hand, we have our development agenda and the vision of 'sabka saath, sabka vikas' while on the other hand there are opportunist alliances and dynastic parties. They want to build their own empires while we want to empower the people," he added.Modi said that success of his government had upset the opposition leaders and that was the reason they were busy in negative politics. "They are abusing Modi and the BJP but they should not underestimate the people. Our friends in opposition are anyway a confused lot. 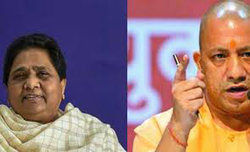 They leave no opportunity to say that Modi is bad, government is not working, people dislike the BJP, yet the first thing they do is form opportunist alliances with parties they disliked till recently and still do perhaps," he said in a apparent jibe at the coming together of SP and BSP in Uttar Pradesh. He asked if Modi was so bad and that his government was not working, why were they making alliances. "Should you not be confidant of yourself? The truth is that they know this government is a working government. They know the poor, youth, women and farmers have a strong bonding with BJP. Just for their own existence, they are making short term alliance," he said. 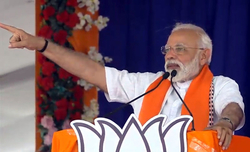 Expressing confidence that his party would do well in the Lok Sabha elections, he urged the workers to keep reaching out to different sections of society. "We are not a coterie-based party but a cadre-based party. Make first time voters your priority." Taking a jibe at Congress, he said it was only in the BJP that a person born to a socially backward and economically poor family can think of reaching the top and needed no loyalty to "one family". "In the BJP, one only needs hard work. We do not need big wallets or loyalty to one family," he said, adding that this made the BJP family different from the rest. To a question on potential of India's MSME sector, he said: "When it comes to India's growth story and the role of small industries, small is big. Small industries may seem small but their impact on employment and on bringing people out of poverty, is big. 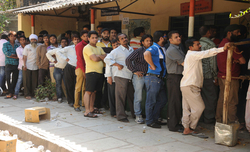 "He said that it was a wrong perception that Ease of Doing Business helped only big companies. It also helped the MSME sector and small businesses.